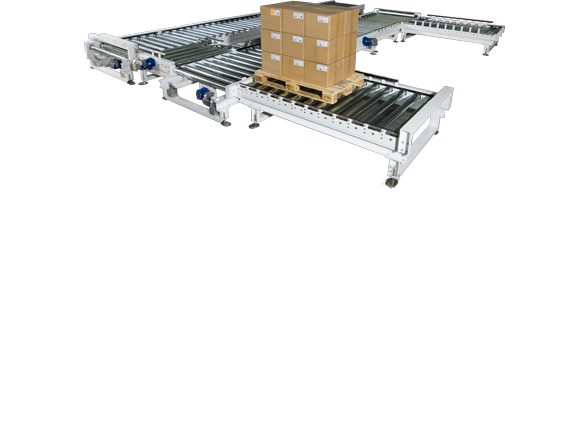 Chain Conveyors are ideal for pallet or other hard item set ups. Chain conveyors are linked metal segments that line either side of the conveyor rails and is moved along with sprockets or pendants and a geared motor. Chain Transfers are used to re-direct products 90° onto an adjacent conveying line. They are ideal for transporting loaded pallets or products with a sturdy conveying surface. Standard capacities up to 8,000 lbs. with 12 inch top of roller height. Chain transfers can be built to your specific requirements. Pivot Chain Transfer bolt in line to CDLR straight sections. Rollers are slaved from an adjoining CDLR straight section and powered chains are pneumatically lifted above the roller surface. The Pivot Chain Transfer has a 35,000 lb. capacity with 6 inch pitch chain and six 16 inch diameter air bags. Reversible Six-Strand Chain Transfer has a 20,000 lb. capacity with 6-1/2 inch diameter rollers, pop-up CDLR conveyors and RC120 conveying chain. AID Equipment has extensive experience with chain conveyors and can integrate one in to your facility or upgrade your existing equipment.